Today’s stories related to the American Legislative Exchange Council (ALEC) and the Koch funded cabal ALEC fronts for. “For many years, the Nevada Legislature has paid $1,000 a year dues to the American Legislative Exchange Council (ALEC), just as it does to groups like the National Conference of State Legislatures and the Council of State Governments. The National Center for Public Policy Research continues to criticize corporations, banks, financial institutions and non-profits who drop membership in ALEC. BoA is the latest to come under fire from this right wing think tank on that issue. Charlotte, NC / Washington, D.C. – At today’s annual Bank of America shareholder meeting in Charlotte, N.C., an attorney with the National Center for Public Policy Research criticized Bank of America CEO Brian Moynihan for caving to left-wing race bullies and dropping its membership the American Legislative Exchange Council (ALEC), a venerable network of conservative state legislators. Bank of America dumped ALEC after a concerted effort by Color of Change, Common Cause and the Occupy movement to defund ALEC by intimidating its corporate members. “Last week North Carolina’s Senate Finance Committee advanced a bill to repeal the state’s renewable energy standard in a controversial voice vote where the outcome was unclear. “It turns out that if committee co-chair Bill Rabon (R-New Hanover) had actually counted the votes as Democrats requested, the measure would have lost. Rabon ignored calls for a show of hands. “WRAL News interviewed the members of the committee who were present for the vote — 25 Republicans and 10 Democrats. All of the Democrats voted against the bill, and eight Republicans said they did as well. Two Republicans refused to say how they voted. Parent Trigger is a key legislative measure advanced by ALEC nationwide as part of their attacks upon public education. Parent Trigger’s are used to turn public schools “around”…that is to turn them into charter schools run by private for-profit and non-profit companies and corporations. Mayoral candidates in Los Angeles hesitated to endorse parent trigger, but just announced their support for the legislation. “It took a while, but Los Angeles mayoral hopefuls Eric Garcetti and Wendy Greuel finally met with parents and students on Monday at Los Angeles Unified’s chronically failing 24th Street Elementary School, where the district’s first “Parent Trigger” took place. “The Parent Trigger, which is viewed as a controversial yet unique education reform tool, allows parents to take over a chronically failing school through petition, which is what recently happened at 24th Street Elementary. “While current L.A. Mayor Antonio Villaraigosa quickly supported the takeover at 24th Street, Garcetti and Greuel — especially Garcetti — hesitated. That’s all over now. “Lawmakers return to Topeka on Wednesday after a monthlong break with a deal just out of grasp to cut income taxes and balance the budget. “Even with deeply rooted differences over renewing a sales-tax hike, key lawmakers say a bargain could crystallize as early as this weekend. “Still, the shape of a solution remained unclear Tuesday after leadership teams from the House and Senate exchanged ideas in Oklahoma City. They’d met there at a conservative American Legislative Exchange Council conference last week. “House Speaker Ray Merrick said three or four tax plans remained in play but declined to provide details. Rep. Ray Merrick (R-27), is quite active in ALEC and a staunch member who serves as a State Chairman, was ALEC’s “Legislator of the Year” in 2010, is an Energy, Environment and Agriculture Task Force member , sits on the ALEC Board of Directors  and attended 2011 ALEC Annual Meeting. When elderly women get arrested for protesting, people pay attention. That’s what happened on Monday in Durham, North Carolina. More than 200 people from various organizations, including lawyers, students, preachers from across the state, physicians, leading historians, and a group of senior citizens known as the “Raging Grannies,” held a peaceful “pray-in” and “teach-in” at the statehouse to protest the Republican-controlled legislature’s agenda. The grannies even sung some anti-war and anti-poverty protest songs. More than 30 people, including some of the Raging Grannies, were arrested during the protest. Several of the bills that have gotten pushback from the Raging Grannies, and other groups, are similar to bills that have been introduced by Republicans in other Southern states, including Arkansas, South Carolina, and Louisiana. Barber said many of the bills are pushed by the American Legislative Exchange Council, a private conservative group backed by major corporations that proposes model legislation on an array of issues such as more vouchers and charter schools. To coincide with the action students are taking, Jobs with Justice has put out a fact sheet on some of the reasons why the target is Sallie Mae. Points range from Sallie Mae having over 1,500 complaints against them filed to the Consumer Financial Protection Bureau (and they’re still open to comments up until May 28), to the fact that they were one of the few large corporations to join the American Legislative Exchange Council in 2012. That’s after public pressure drove corporations such as McDonald’s away from the organization for supporting legislature such as the “Stand Your Ground” law. Why does Idaho come in ninth in one index evaluating state business taxes and climates, but 31st in another? The report details four business climate indices — including the American Legislative Exchange Council’s “Rich States, Poor States” report, which ranks Idaho in the top ten, and the Small Business and Entrepreneurship Council’s U.S. “Business Policy Index,” which names Idaho number 31 — and is available here. The bill signed into law in 2012 is entitled, “Firearms Destruction Prevention Act”. No kidding, that’s the title. Moreover, the bill to save confiscated guns from destruction was written and lobbied by the American Legislative Exchange Council (ALEC)….you may have heard of them. A few months before passage…. ….. the corporations and legislators on the ALEC Public Safety and Elections Task Force had adopted a version of the “Firearms Destruction Prevention Act” (also known as the “Disposition of Firearms in State and Local Custody Act”) as a “model,” at the behest of the NRA. Both the ALEC/NRA model and the Arizona law have the same functional impact. When the bill was introduced in the Arizona state Senate, twenty out of its twenty-six sponsors were known ALEC members. The bill thus goes to Gov. Mary Fallin, giving her an opportunity to sign it and a sweeping workers compensation reform measure while the American Legislative Exchange Council, a driving force behind much of the nation’s conservative lawmaking, holds its annual convention in Oklahoma City. Fallin is scheduled to speak to the convention on Friday. Bitter from a lack of support for his attacks on clean energy incentives, North Carolina Representative Mike Hager is promising some new, dirty tricks to revive the effort. His colleagues in the NC Senate appear to be helping, today advancing the Senate version of Rep. Hager’s bill through committee without counting the votes. Representative Mike Hager is a former engineer at coal-burning utility Duke Energy — the largest utility in the country and one of the biggest carbon polluters in the world – and a member of the contentious American Legislative Exchange Council (ALEC), which created the model bill that became Hager’s attack on renewable energy on the dime of companies like Duke, Exxon, Koch Industries and Peabody Energy. So who is behind these bills? Many of the documents contain wording very similar to the original draft written by the lawyers of the American Legislative Exchange Council (ALEC), a corporate lobby group posing as a non-profit, ‘non-partisan’ think tank. Until recently, ALEC managed to keep its methods and its membership secret; however, a leak followed by a Freedom of Information Act filing revealed that the organization drafts bills on behalf of transnational corporations, and persuades its legislative members (i.e. conservative Senators and Representatives) to introduce those bills. ALEC has secretly lobbied on behalf of the tobacco industry, the gun industry, and against minimum wage laws, all behind closed doors. The organization is effectively a dating agency which matches legislators looking for donations to their campaign funds with big businesses who want an influence on the law. This is an ambitious study that analyzes six different indexes published by five different groups. Four are simple combinations of a wide variety of policy variables, each with its own idiosyncratic weighting systems, all of which are published by conservative organizations such as the Tax Foundation or the American Legislative Exchange Council (ALEC). The American Legislative Exchange Council recently released its ranking by state of K-12 performance, progress and reform. Georgia’s education policies grade was B-. The state academic standards were B+ for English and language arts and A- for mathematics. Delegate Ron George has served in the Maryland House of Delegates since 2007. Delegate George serves on the Ways and Means Committee, Election Law Sub-Committee, Education Sub-Committee, Transportation Sub-Committee, Veterans’ Caucus, Sportsmen’s Caucus, The Commission on Campaign Finance Reform, and the Waterways Workgroup. He is the Founder and Chair of the Doctor’s Caucus. He serves on the American Legislative Exchange Council’s Tax and Fiscal Policy Task Force. HARRISBURG (AP) — Pennsylvania state lawmakers and other public officials are disclosing gifts, travel and other financial details in annual reports due with the State Ethics Commission. Elected members of the Legislature reported more than $43,000 in gifts, transportation, lodging and hospitality last year, a number that should rise after the remaining one-fourth of the 253-member body submits their Statements of Financial Interest. The reports are due on Wednesday. Members accepted travel-related costs for trips to Ireland, Arizona, Illinois, New York, North Carolina and Washington, D.C., among other places. They took free ski passes, entertainment and a membership in the Erie Yacht Club. Rep. Daryl Metcalfe, R-Butler, said the $2,224 he reported from attending two American Legislative Exchange Council meetings was not for a vacation. Today there are numerous articles on ALEC and many of their legislative pursuits in states like South Dakota, Michigan, North Carolina. and elsewhere. In order to keep readers with an interest in ALEC up to date on stories related to ALEC, we’re posting this page with brief descriptions of ALEC activities and links to the articles or material(s). Included in this update are links to measures or articles published by ALEC itself, showing their take on issues. Rep. Hager is a known ALEC member and ending renewable energy subsidies is a pet model bill of ALEC. “ALEC has zero model bills to repeal incentives for coal, oil or gas companies, and rolling back state renewable energy incentives is one of ALEC’s national priorities for the next couple years. ALEC’s energy company members like Koch Industries, ExxonMobil, Duke Energy, and Peabody coal are hungry for a anti-renewable trophy after suffering a defeat in Kansas and now North Carolina. closed-door meetings with legislators who are part of ALEC. 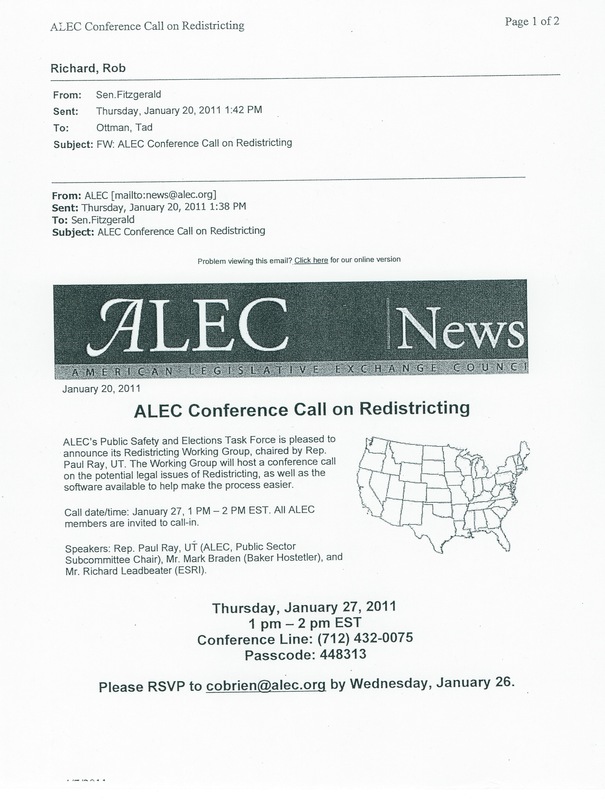 “As the federal court ruled on Wisconsin’s maps in February of 2012, the Center for Media and Democracy (publishers of PRwatch.org) revealed that the American Legislative Exchange Council (ALEC) had invitedlegislators to redistricting conference calls, based on emails obtained through earlier open records requests to Senate Majority Leader Scott Fitzgerald. “It’s worth noting that the American Legislative Exchange Council, a Koch-brothers-related group that creates “model legislation” promoting a radical, anti-regulatory and anti-tax agenda, is a fan of the voucher system. “The group, which allows corporate interests to weigh in on model legislation before it’s approved by public officials, has several voucher bills available on its website. The Koch Brothers and their company, Koch Industries are long time supporters of ALEC. Koch Companies Public Sector, LLC holds a seat upon ALEC’s Private Enterprise Advisory Council (formerly ALEC’s “Private Enterprise Board of Directors). “To succeed you must “produce.” For Murdoch, distributive justice is the natural outcome of these purely commercial transactions. He quotes Arthur Brooks at the American Enterprise Institute who defines fairness as, “… the universal opportunity to enjoy earned success”. The key words here being “earned success.” Accordingly, producers are entitled to all they earn because if their product wasn’t successful, consumers are free to not buy their product. This would be a cruel argument to make in the presence of an elderly person having to choose between buying food or medicine. Nevertheless, in this view every sale in a free market system automatically results in a fair distribution of wealth. No other social factors should apply. In fact, to take from producers what they’ve earned to support the lives of less successful or non-producing human beings is immoral, in Murdoch’s view. “The American Legislative Exchange Council (ALEC), which is centrally involved with pushing environmentally destructive legislation on behalf of the fossil fuel industry, today complained that “Earth Day has been a largely somber event” when it should be “a celebration of the wonderful achievements humankind has made in cleaning and greening the planet,” wrote Todd Wynn, ALEC Energy, Environment, and Agriculture Task Force Director. Earth Day: You have got to admit it is getting better. A little better all the time! This morning was my annual appointment with the CPA to figure my taxes. I use a CPA, not because my taxes are terribly complex, but because I want to be sure they are spot-on accurate. I like sleeping at night, and in the spirit of that bumper sticker: “I’m a grown-up, I pay my taxes”. Taxes aren’t fun, but I like to believe most Michiganders feel the same way. Governor Snyder told reporters this morning that his new pick for Detroit Emergency Manager, Kevyn Orr, is still a-okay with him in-spite of the recently uncovered tax liens on his Maryland home. The Associated Press reports that Snyder claimed his administration did a “very thorough job” in vetting the Emergency Manager candidate. He went on to say that now that this minor brouhaha is over, Orr can concentrate on the business of getting “Detroit going again“. Of course, to millionaires like Snyder and Orr, thousands of dollars of unpaid taxes is mere sofa change. When the governor was running for office it was revealed that two of his venture capital firms incurred tax liens for not paying employee withholding and business taxes. At the time, Snyder’s campaign spun it as an “oversight”. Yet Snyder continues to pick tycoons and raiders that specialize in cut-back management, who operate without input or oversight, and think paying taxes is optional. The Center for Political Accountability announces that engagement has led to six corporations agreeing to adopt political disclosure and accountability, while a shareowner resolution at Visa gains significant support. SocialFunds.com — Last year, the Center for Political Accountability (CPA) announced that the number of public corporations agreeing to disclose their political expenditures had reached 100. More than half of the companies are listed on the S&P 100. As reported here in late November, it now appears that the Securities and Exchange Commission (SEC) is considering a rule requiring that “public companies provide disclosure to shareholders regarding the uses of corporate resources for political activities,” according to Paula Dubberly, a Deputy Director of the Division of Corporation Finance at the SEC. However, sustainable investors and other advocates are not simply waiting for a rule to materialize; CPA reports that more than 50 resolutions were filed with corporations this proxy season, requesting that they adopt political disclosure and board oversight. It’s also apparent companies themselves are acknowledging reality, as not only the number of resolutions but the vote totals as well continue to rise. At Visa’s annual general meeting this week, for instance, 37% of shareowners votes in support of a resolution requesting that the financial services company disclose all payments used for lobbying purposes, including payments to trade associations. 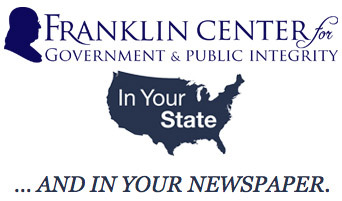 “We persist, though, in bringing this proposal to ballot as the company has not yet contemplated any disclosure to shareholders on lobbying spending connected with trade associations or other tax exempt organizations,” Benton continued. Also this week, CPA announced that six corporations avoided having resolutions on political spending come to a vote by agreeing to adopt disclosure and accountability. Boeing and Mylan, a pharmaceutical company, came to agreement after resolutions during last year’s proxy season gained significant support. KeyCorp, Harley-Davidson, Deere & Co., and AmerisourceBergen also agreed to disclosure of political expenditures. “The companies have agreed to disclose their direct corporate political contributions, indirect political spending through trade associations and other groups such as ‘social welfare’ 501(c)(4)s and to implement board oversight,” CPA stated. The withdrawn resolutions, which were based on the CPA model, were filed by Investor Voice, the New York State Common Retirement Fund, the Nathan Cummings Foundation, the International Brotherhood of Teamsters General Fund, and William Zessar. “Hidden political spending soared off the charts in the 2012 elections, but a steadily increasing number of American companies are choosing an alternative, the Center’s model for disclosure and board oversight of corporate political spending,” said CPA President Bruce Freed. editor’s note: We would like to extend our thanks to Alexandra Forter Sirota of the NC Justice Center, who took the time not only to read our re-posted article, but to let us know that the graph used in the report had been updated by the NC Budget and Tax Center. Aside from just adding both to my daily RSS feeds, this updated article includes their updated graph. North Carolina State Senate leader Phil Berger (R-Eden) (R-ALEC) is indicating that the preferred “Tax Overhaul” which will be put before the legislature by the Republican majority and designed by Art Pope’s (R-ALEC 1995) Civitas Institute will eliminate most corporate taxes, do away with personal income taxes, and raise sales/consumption taxes to as much as 8.5%. According to a study by The North Carolina Justice Center released last week, one of the effects of this change would be to raise the taxes of a family of four earning $24,000.00 a year (the Federal poverty line) by $500.00 and give those making over $1 million are year a $41,000.00 tax cut. The plan eliminates the personal income, corporate income and franchise taxes, which, combined, generate $12 billion in revenue for North Carolina schools, infrastructure and other public priorities. The revenue loss would be replaced via a higher sales tax that would cover more goods and services, a business license fee and a real estate transaction fee. For North Carolina’s top 20% of North Carolina’s wage earners the change in the tax code would be a major financial boom while the remaining 80% comprised of the working class and the working poor would bear the brunt of the new burden. Eliminate the personal income tax, which generated $10.3 billion during fiscal year 2011-12. Eliminate the corporate income tax, which generated $1.1 billion. Eliminate the business franchise tax, which applies to businesses that are incorporated in North Carolina and generated $650 million. Raise the state sales tax to 6.53 % from 4.75 % and expand it to include currently exempt goods, as well as services that are currently not taxed. The plan purports that the sales tax would generate an additional $7.6 billion. Create a real estate transaction fee that would apply a 1 % tax on the total value of commercial and real estate transactions when they are transferred, which would raise an estimated $390 million according to the plan. Implement a business license fee that would apply to businesses based on their earnings, assets and losses, with a minimum fee of $500, which would raise an estimated $4 billion. Will not raise enough revenue to meet North Carolina’s current and future needs. Its structure threatens the state’s ability to respond to changing economic conditions. First, thou shalt keep taxes low. Second, thou shalt reduce taxes on income and wealth. Third, thou shalt keep marginal tax rates low and relatively uniform. There is no evidence of a direct relationship between top tax rates and economic or job growth. According to a 2012 study by the Congressional Research Service. Moreover, states that Laffer himself has termed “high income tax states” turn out to have economic conditions comparable to, if not better than, states that do not have a personal income tax, according to the Institute on Taxation and Economic Policy. In fact, states with low income tax rates actually have lower employment growth and lower median household income than Laffer’s designated high-tax states according to a recent study by Good Jobs First and the Iowa Policy Project. Furthermore, the industry composition in a state has a greater impact on a state’s economic performance. Similarly, an educated workforce, the presence of research centers like major universities and other knowledge factors boost per capita income growth. Accordingly, states will likely suffer in the long run because they lack the resources needed to invest in education and other building blocks of economic growth. While it is not clear exactly what any final legislation will look like, it appears that the State Legislature is heading in the direction of raising taxes on 80% of North Carolina’s population. Governor Pat McCrory is yet to make a statement to indicate his Administration’s position on the tax raise. Art Pope is an Administration official, however, and it is possible that his statements reflect the position of the McCrory Administration in spite of Pope’s financial sponsorship of the Civitas Institute. This article was posted at the Camel City Dispatch, at http://www.camelcitydispatch.com/state-legislature-to-consider-raising-taxes-on-80-of-north-carolinians/ It was the best written explanation I found of the Civitas-Laffer plan using the data from the Institute on Taxation and Economic Policy. Over the past couple weeks, fossil fuel interests and their allies have ramped up attacks on clean energy on the state level. As the Washington Post reported in November, the American Legislative Exchange Council (ALEC), a fossil fuel-funded advocacy group, has made it a priority to eliminate clean energy standards across the country. From the East Coast to the Southwest, ALEC members, alumni and operatives are moving full steam ahead to eliminate clean energy projects and the policies that support them. However, not all of these attacks are coming from ALEC members sitting in state legislatures. In Ohio and Virginia, former ALEC legislators, now in other positions, are driving anti-clean energy attacks. Below is part one of our series this week on former ALEC legislators spearheading fossil fuel-funded attacks on the clean energy industry. Two weeks ago, Virginia Attorney General Ken Cuccinelli, a former ALEC legislator, struck an agreement with Dominion, one of the largest electric utilities in the U.S., to support legislation effectively eliminating the state’s voluntary clean energy standard. According to the Associated Press, under the agreement, the power companies would no longer have the same financial incentives for using sources of renewable energy in Virginia. Without a legally-binding clean energy standard, killing the financial incentives of the law would stop big utilities from investing in new sources of energy (editor’s note: This is ALEC’s “Electricity Freedom Act”, as reported here), especially when they can keep profiting off of old coal-fired power plants. $50,000 from David H. Koch, co-owner of Koch Industries, a major fossil fuel conglomerate. $25,000 from Consol Energy, a coal and natural gas producer. $10,000 from Alpha Natural Resources, a coal mining and processing company. $10,000 from Appalachian Power, a subsidiary of American Electric Power, one of the largest electric utility companies. $10,000 from Dominion, one of the largest electric utility companies. $10,000 from Koch Industries, a major fossil fuel conglomerate. The Attorney General’s office claims that he sought to eliminate the standard because it allowed utilities to buy renewable energy certificates from existing facilities rather than build new clean energy in the state of Virginia. Dominion charged ratepayers $77 million as part of the clean energy law, without building a single clean energy project in the state. Virginia Attorney General Ken Cuccinelli at an event sponsored by the Koch Brothers’ Americans for Prosperity. But, Mike Tidwell, of the Chesapeake Climate Action Network (CCAN), which has worked with lawmakers to propose several bills to improve the incentive program, said that, “The standard is flawed; but there’s a clear way to fix that.” CCAN is working with Delegate Alfonso Lopez to propose a solution that would require Dominion to invest in wind and solar projects in Virginia in order to qualify for financial incentives. But instead of trying to fix the renewable energy standard, Mr. Cuccinelli is advocating for the elimination of clean energy incentives while also raking in over $100,000 dollars from fossil fuel interests for his gubernatorial campaign. This clear conflict of interest is compounded by the fact that Mr. Cuccinelli was a member of ALEC, which has publicly stated eliminating clean energy laws as one of its goals for 2013. And, it is Mr. Cuccinelli’s fossil fuel donors, most of which are corporate members of ALEC, that stand to profit from killing clean energy laws and slowing the growth of the clean energy economy. Instead of fighting for Virginia families and small businesses, it appears that Mr. Cuccinnelli is more concerned with the interests of his big, fossil fuel donors. It’s probably a good indication of how he’ll run the state from the governor’s mansion. In Ohio, no legislation has been proposed to rollback the state’s “Alternative Energy Resource Standard,” yet. But three weeks ago, former ALEC legislator Todd Snitchler, now Chairman of the Public Utilities Commission of Ohio (PUCO), and two other commissioners, decided to squash a solar power plant proposed by American Electric Power (AEP) – a move that seems to correlate with ALEC’s agenda to stop the growth of the clean energy market. AEP planned to build the Turning Point solar power plant, a 50 MW solar power plant comprised of panels from a factory in Ohio. The company planned this project to comply with the requirements of the renewable energy standard according to the PUCO opinion and order. Ohio’s clean energy law calls for 12.5% of the state’s electricity to come from renewable energy resources by 2025. Todd Snitchler, Chairman of the Public Utilities Commission of Ohio, with Governor John Kasich. Both politicians are ALEC alumni. One of the primary opponents arguing against the solar plant in front of the PUCO was FirstEnergy Solutions, an electric utility (that generates 72% of its electricity from fossil fuels) and a major donor to Governor John Kasich, another ALEC alumnus. Gov. Kasich received over $600,000 from oil, gas and mining interests for his 2010 election campaign and in early 2011, Gov. Kasich appointed Mr. Snitchler to chair the PUCO. Mr. Snitchler and the two other Republican commissioners voting to stop the Turning Point solar plant disregarded Public Utilities Commission of Ohio staff experts who stated that the project was necessary to comply with the state’s renewable energy standard. Mr. Snitchler’s Twitter traffic affirms his ideological disdain for clean energy. He consistently attacked clean energy technology and the legitimacy of climate science (ignoring the Pope, United States Military, and every national academy of science in the world) according to a Columbus Dispatch analysis of his twitter traffic over the past year. With anti-clean energy ALEC alumni in powerful positions in Ohio, pro-clean energy advocates must work to stop attempted rollbacks of the state’s clean energy standard in the state legislature or face a grim future in the Buckeye state. editor’s note: all emphasis in the article is mine.